We’re not just grass cutters. In fact, if that’s all you want, we recommend you hire the neighbor’s kid next door. 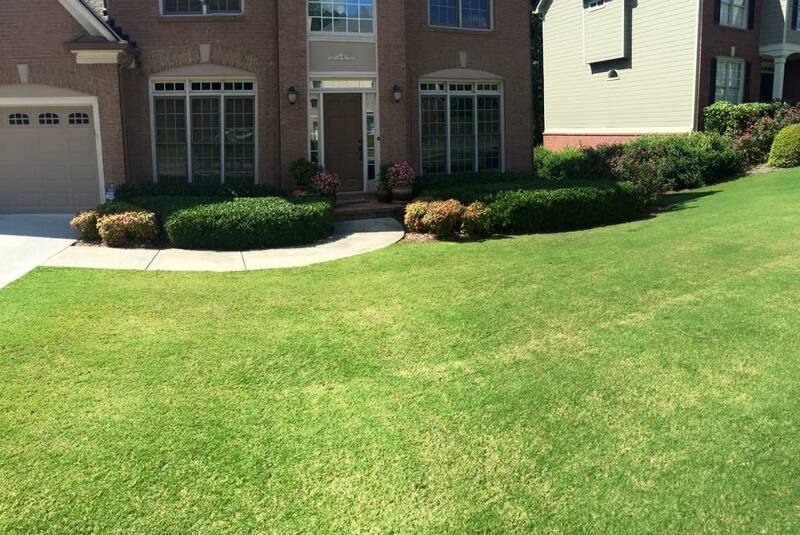 We do however maintain yards to a standard of perfect that your typical lawn cutter cannot provide. No matter how much you landscape a yard– you could have the most beautiful garden, but if your grass looks bad it reflects poorly on your whole house. Many of the houses built in the Atlanta market used contractor grade bermuda grasses since they are inexpensive to install, are heat and drought tolerant, and also thrive in our climate. The only problem with these grasses is that if you have any shade, they will not grow in the shade, leaving bare spots which erode and make your yard poorly. Bermuda grows quickly and needs maintenace regularly, as it often creeps into flower beds. Although we do not chase lawn maintenance work by itself becuase most clients are just looking for someone cheap to cut their grass, we do provide maintenance for our clients to that their whole home looks beautiful. This way, the sod or landscaping we install continues to be beautiful throughout the year, meeting our standards of care, giving you a lush, green lawn, the will be the envy of all of your neighbors.